We have just released an exciting new update to Kalix with lots of new features and fixes. We've previously referred to it as the correspondence feature, but we have made it more than that. Kalix now allows to you use merge fields to auto add information from your appointments, clients' details page, referrals and contacts. To view the list of supported merge fields and instructions on how to implement this feature, click here. You can also view this information by clicking on Help under Quick Links on the top of each document and template in Kalix. Or via Kalix's support site. Due to popular request, Kalix will no longer automatically adds client details (name, date of birth and document date) to the top of Document (e.g. chart note) Word exports. 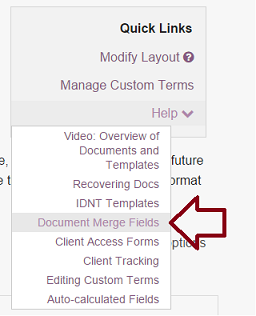 Now Kalix allows you to create your own client information panel by adding merge fields to either the header and footer of your Doc Layout or the top of doc templates. For already created documents and templates, we have added a client information panel for you. It is a free text field. You can edit it but clicking on the field or delete it by clicking on the trash icon. Doctor letter templates in Kalix's Template Library have been updated to contain the new merge fields. If you already using a doctors letter template from Kalix's Template Library, please note the following. Templates from Kalix's template library do not automatically update. If you wish to have the updated version of your template, please delete it from your account and re-add the template from the template library. Alternatively, add your own merge fields. We will continue to release new templates as part of Kalix's template library very soon, these templates will include appointment letters as well as many others. Kalix now allows you to add signature panels to documents and templates, to support electronic signing (by you or your clients). Add signature panels to custom and NCPT documents and templates. Electronic signatures are supported on computers, laptops, tablets and smart phones. We have added the ability to hide the last client file link from the top header. Click on the cross as shown below. We have you find these updates useful. We will continue to update all of Kalix's support information to reflect these changes.